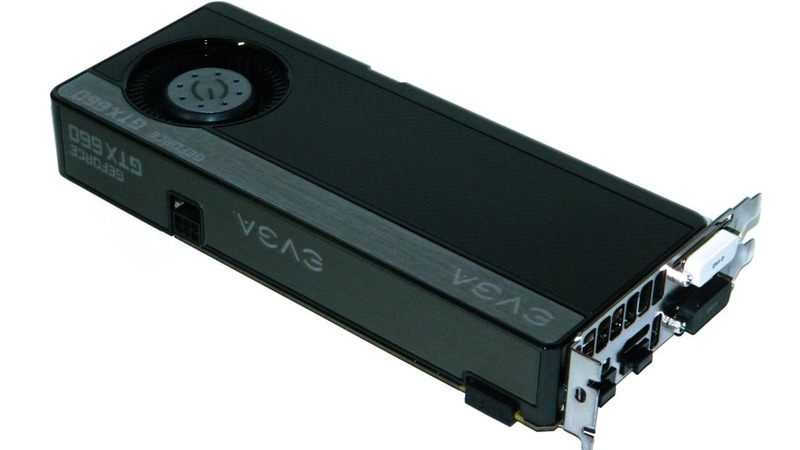 We very recently reviewed a number of NVIDIA GTX 660 Ti GPUs in our recent launch round up where Kepler established a new standard of performance at $299. All the brands tested far exceeded the benchmark set by the previous GTX 560 Ti which was to provide fluid 1080p frame rates and introduce new technologies like FXAA, and TXAA sampling. However, NVIDIA had yet to hit the magical $199 sweet spot that most gamers with a budget can afford. Today is the day that they fill that sweet spot so join us for a quick look at the the brand new GeForce GTX 660 with EVGA's Superclocked edition. Now let's see what EVGA has done to the stock GTX 660! 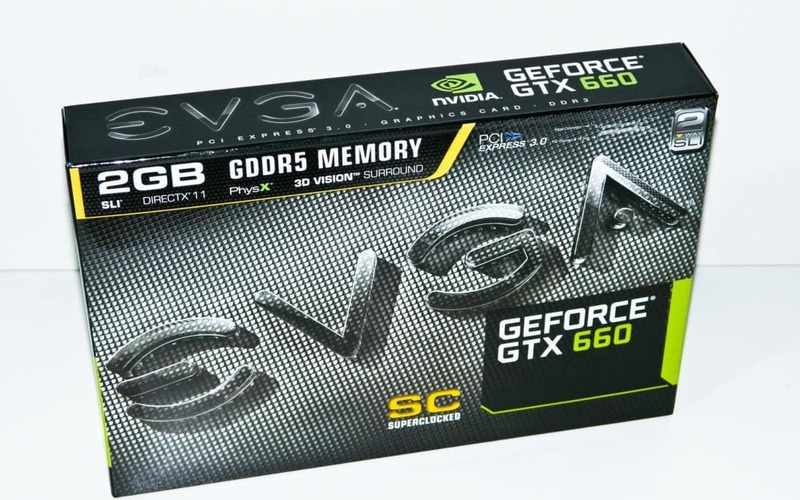 EVGA has chosen to launch with two versions: A 2GB and 3GB model. The 2GB card should fit nicely with casual gamers while the 3GB will mostly like please a more serious gamer who likes higher resolutions and higher detail settings, and should help those of us that donate the unused compute cycles for Folding when not gaming. 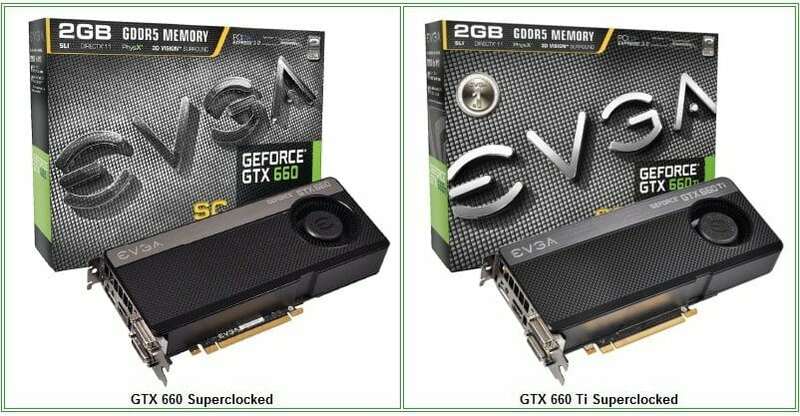 Both of these cards are not stock vanilla cards, so the prices for the 2GB Superclocked start at $229.99 while the 3GB hits at $269.99 US/CA. But of course, more vanilla versions of the GTX 660 are available from other manufacturers. We give you the exact break down of each card below along with how it compares to the previous generation GTX 560 Ti and the higher end GTX 660 Ti. 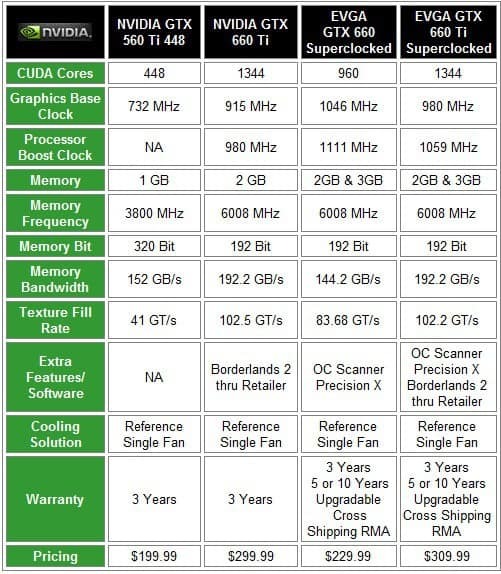 The nice thing about the EVGA GTX 660 Superclocked is the increased core clock and boost clocks. The impressive memory frequency, bit rate, and memory capacity allows turning up of game, or program details that would otherwise slow cards lesser cards. Speaking of memory, the GTX 660 utilizes Samsung video memory while the GTX 660 Ti uses Hynix. Also worth noting is that the Precision X overclocking and OC Scanner monitoring programs get another custom face lift just for this card. However, these will work with other vendor cards as well. The rest of the built in NVIDIA features include the SMX Engine, Adaptive Vertical Sync for eliminating those missing frame jitters, Surround technology for multi-monitor support (up to 4 displays), PhysX for creating a more realistic environment, 3D Vision and Vision 2 ready, 2-way SLI, and CUDA technology for extra GPU computing power. At a glance, the EVGA GTX 660 and GTX 660 Ti are twins. In fact, very little is changed between the two since most of differences are inside the GPU die and card firmware. The card sports a standard single fan GPU cooler with graphics that identify it as an EVGA product. Noise and temps are expected to be extremely similar between the two cards because of these design similarities. The PCI ports are the same on both cards as well. Users have the option of using dual DVI, one HDMI, and one Display ports. That gives you connectivity all the way up to four displays for 3D surround gaming, or if you need the real estate for productivity. To enforce sweet spot $199 price, the card requires only one 6pin PCIE power cable from a minimum 450 watt power supply. Using or purchasing a good quality 80Plus 550-600 watt ensures you have room to grow if you purchase a second card for SLI. However, this also makes the card a great upgrade for folks with older systems with weaker power supplies, which naturally, saves the user in upgrade costs. This is important at the higher value end of the spectrum. Based on a quick comparison of features and specifications, plus the $199 price point, this card looks poised to take gamers to a new level of performance. Especially if they are coming from GTX 4xx series cards or older. Let's see if there is any extra value added in the bundle.